Daulat ki Chaat (or Malaai Makkhan, as it is called in U.P.) is not a tangy treat of the sort the word chaat evokes. This incredible little dish is made up almost entirely of air: it is essentially just milk froth. They start making it at about 2 o’clock at night, and insist that their only contribution is to churn some creamy milk and whip up its froth — the rest is the magic of the winter dew. This whipped froth of milk is set in a large brass pan, and some khoya and finely sliced pista are sprinkled on top. The entire delicate ensemble is brought to the market in the morning on a khomcha (a cane tripod), where if you ask nicely, the man will scoop out a generous portion of the froth, powder it with bhoora (unrefined sugar) and khurchan, and hand it to you in a little leaf bowl. A spoonful of it just vanishes in the mouth, and has a very sophisticated, understated sweet taste to it. We were lucky to catch this vendor on our way from Hauz Qazi Chowk (where the Chawri Bazaar metro station is) to the Jama Masjid. His normal beat is Kinari Bazaar, close to the Dariba area of Chandni Chowk, but he probably starts in the morning from the Hauz Qazi area — we were there at about 8:30am. If you ever manage to catch the elusive Daulat ki Chaat vendor, give him a miss at your own eternal loss! Location: Kinari Bazaar has at least a couple of vendors, including one (Khemchand Adesh Kumar) at the corner of a cul de sac called Naughara — an official heritage site with beautifully ornamented entrances to well-preserved havelis. I have mapped this location here. Timings: Winter mornings till about 10 am. Heavens! I’ve tried the Daulat ki Chaat. It’s the kind of stuff which makes your head whirl, and then sends you to heaven! What a pity Mr. Daulat-Wala is such an elusive guy! We found him in a small cubbyhole in Gali Sita Ram off Chawri Bazar. It was a particulalrly proud moment since we were accompanied by a foreigner, who was simply bowled over! When you have entered Sita Ram bazaar I am surprised that you did not tried Kudemal ke Kulfi, very plain very basic. though he has lot of other flavours e.g. papaya, grapes, apple, avacado, etc. but the kaser kulfi is the best at 20Rs it is such a bargain and also if you like to take more for later reference they also do the packing in ice and salt. with the containers as very less extra cost or sometime even at no extra cost. 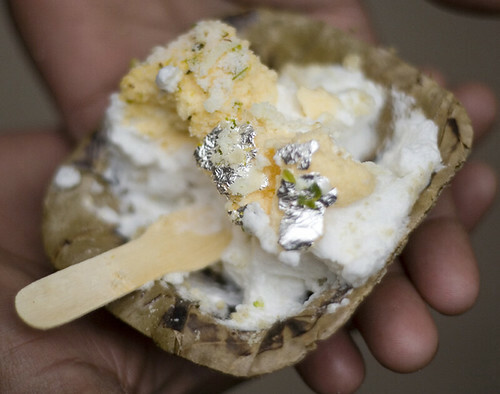 Man I saw you on Bizzare Foods with Andrew Zimmern a few minutes back – thanks for taking the dude to eat Daulat Ki Chaat – you helped showcase a Delhi jewel that most so called Delhi wallahs have never tasted. I myself have only heard of this esoteric concoction from my mother and Nanaji – next time when I am back home I vow that I am actually going to eat it. I am surprised that you did not take him to the Jalebi wallah at the mouth of Dariba Kalaan though. Also have never eaten at Haaji Nooria’s, first time I heard of it – is it better than Jawahar’s nihaari? oh my god, my mother will be so happy to know this is available in delhi. she had mentioned having “namish tarawat” many a time in lucknow and missed it a lot!